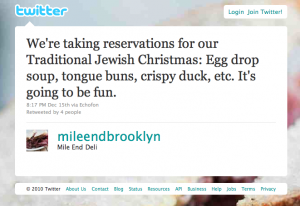 Mile End Delicatessen, which is famed for its Montreal-style Jewish food (such as smoked meat), is drawing a ream of publicity for its decision to serve Chinese food on Christmas. (It’s of course had its share of press anyway. People love writing about Jewish food). 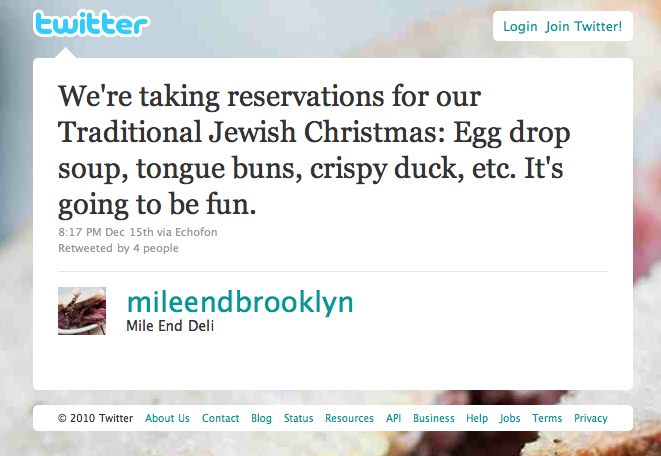 They originallyÂ announced it on Twitter, “We’re taking reservations for our Traditional Jewish Christmas: Egg drop soup, tongue buns, crispy duck, etc. It’s going to be fun.” And it just exploded. Reservations full, so they are doing another seating at 2 p.m.
Something fun. They are doing Smoked Meat Fried Rice. Like pastrami fried rice, but the Montreal version. Smoked meat is like a cross between pastrami and corned beef. An alternative path of evolution from New York. Interesting in part because I wonder if Canadian Jews have the same tradition as American Jews..